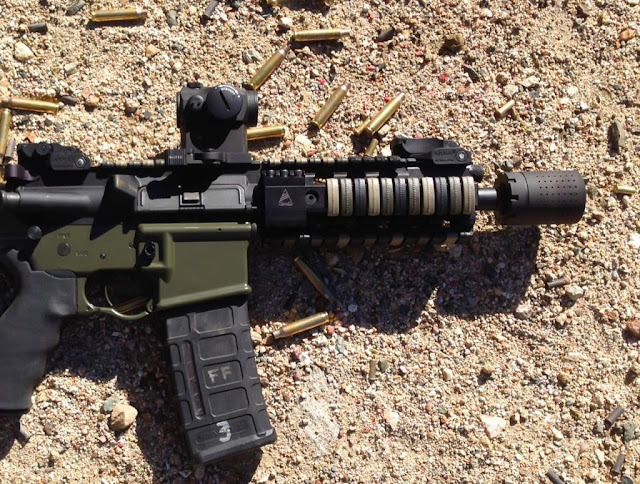 Our friends over at Jerking the Trigger first introduced us to Ferfrans CQB Modular Muzzle Brake System and we can certainly say that it is an intriguing concept given some misgivings from many about the use of muzzle brakes or compensators. JTT has some great coverage, so definitely check out their article, we just thought this should get a second look for anyone that missed it over there. Several respected firearms instructors from Jason Falla and Larry Vickers to Mike Pannone have expressed the failings in use of muzzle brakes or compensators due to their increase in flash signature as well as side blast and concussion which can be a big detriment in CQB conditions or simply on the range when you want to be a courteous neighbor to other shooters. While certain devices are better than others, one can certainly ascertain that mitigating these issues could offer an improvement as long as the overall compensation for muzzle rise and recoil are still present. The FF CQB System is a two part muzzle device consisting of a muzzle brake that attaches just like a standard flash hider to a 1/2x28 threaded barrel chambered for .223 Rem/5.56x45mm NATO. The secondary part, which really brings something else to the game is the Concussion Reduction Device (CRD). The CRD is simply attached to the FF Muzzle Brake as you can see in the video below and locks into place. This addition also has its own ports allowing for the muzzle brake to still function as needed. This may help with any potential NFA question that may arise as we are sure it will in the forums. We have to admit that the video below gives a pretty convincing demonstration of the positive attributes provided by the CQB Muzzle Device System in various scenarios. Clearly you can make your own opinion with the quick video intro. Our research has brought up an MSRP price of $185 for the CQB Muzzle Device System, which given all of the components and unique attributes is not too far fetched based on other products on the market. Obviously, you have to pay more to get more, so we are definitely curious as to what others will experience while using the new muzzle device and where this development could lead in future innovations. As with several other muzzle brakes/comps, generally a 5.56 model is introduced and the immediate question for successful products is, "Will there be a .308 version." All signs lead to yes on this one as well.